Really Great Smokey Baby-Back Ribs (serves 6-8) | Crappy Kitchen - Good Dinners! This past weekend was a hectic one to say the least and I had to be smart about what to cook. The best kinds of dishes to cook when you have guests and are on the go are ones that demand little time to prepare, slow cooking and are hearty enough to keep everyone happy for hours. This dish most certainly fit all the criteria and was more delicious than I could have imagined. 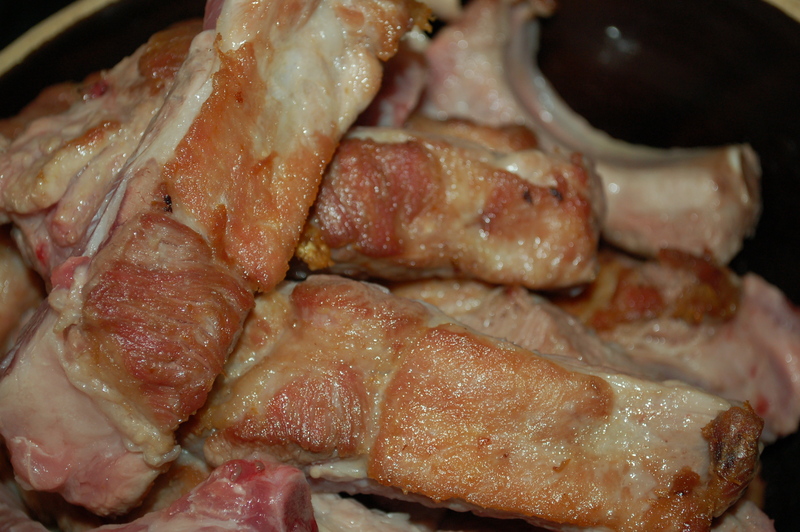 I implore you to add this to your list of ways to cook my favorite kind of pig: Baby-Back ribs! 2 racks baby-back ribs, cut into 2 to 3 rib pieces, seasoned lightly with sea-salt and black pepper. Equipment: you will need a very large casserole with lid for this dish. 1 – Sear the prepared ribs (see ingredients list instructions) in batches on high heat in large saute pan until browned on both sides. You will need to add more oil as you go. Transfer to a big casserole (with lid) that can be put into the oven. 2 – turn heat down to medium and add the onions and cook for about 5 minutes before adding the chopped chipotle peppers, adobo sauce and parsley. 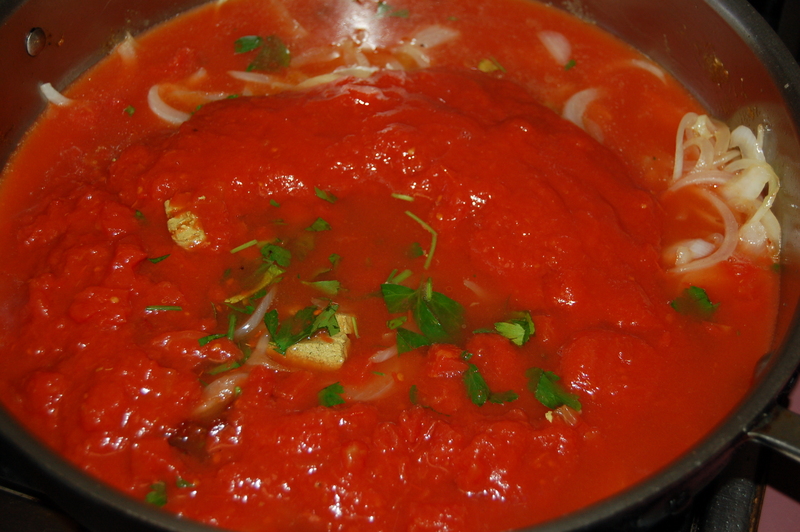 3 – Add the tomato puree, broth (or water and bouillon cube) and salt and bring mixture to a boil. 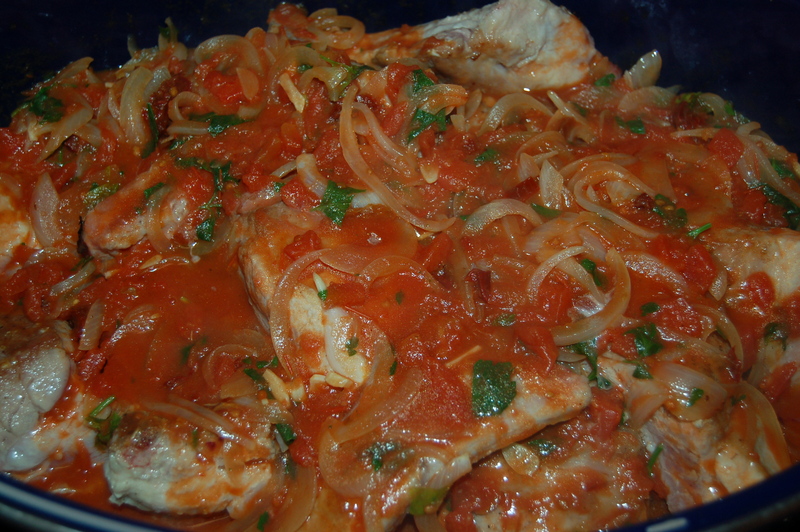 4 – Pour this mixture into the casserole over the ribs and place in the oven for 1 1/4 hours. Remove from oven and check meat by piercing with a sharp knife. If it is very tender you can remove it from the oven. Let it sit covered for about 10 minutes before serving. Taste the sauce for additional seasoning. Also, if the sauce is very thick you can add a little more water to thin it out to your liking. Serve each person 2 or 3 rib sections with whatever you like, (suggestions below). You can also have some cayenne pepper flakes on the table for those of you who like more heat. A sprinkle of some flat-leafed parsley would not go astray either! 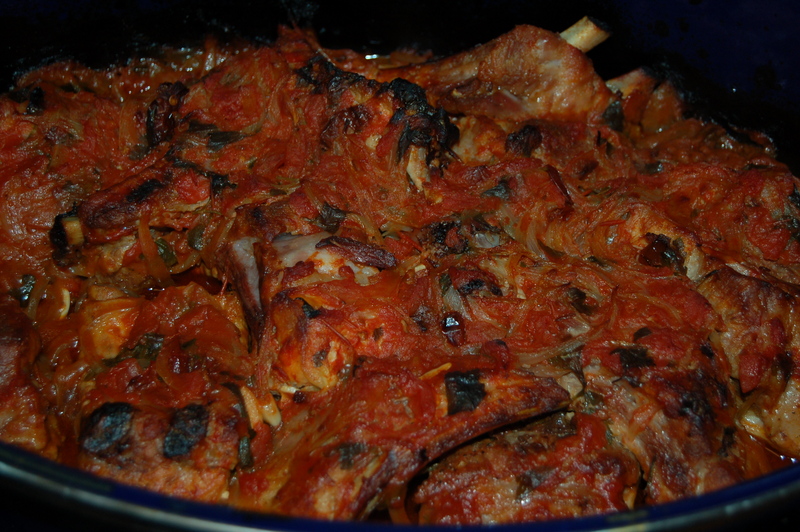 The meat can also be removed from the ribs and returned to the sauce which makes it easier to eat, especially if you serve it with a long pasta like spaghetti or tagliatelle. 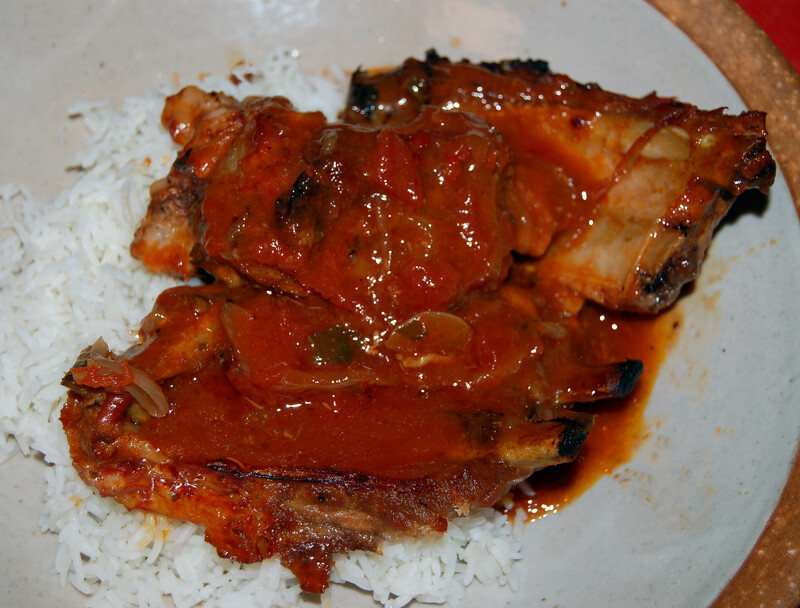 This entry was posted in dinners and tagged baby-back ribs, baby-back ribs in red sauce, basmati rice, easy dinner, easy ragu, pasta dish, pasta sauce, pork and rice, red sauce, san marzano tomatoes, slow-cooked pork, slow-cooking, smokey red sauce, weekend dinner. Bookmark the permalink.